Clinging to water bottles and impromptu fans hastily assembled from scraps of paper, the residents who filtered into the Woodhaven Residents’ Block Association meeting at St. Luke’s Church last Saturday were of the die-hard ilk: They came, they sweated and they didn’t leave until they covered everything from concerns over rowdy children in the newly opened London Planetree skate park to supporting veterans in the community. A string of legislators’ representatives – and one lawmaker, State Sen. Joe Addabbo, Jr. (D-Howard Beach) – addressed a wide variety of issues at the two-hour WRBA meeting that managed to draw a sizeable crowd, despite Saturday’s temperatures that hovered in the triple digits. Rudy Giuliani, chief of staff to Councilman Eric Ulrich (R-Ozone Park), told audience members that additional police are expected to patrol the London Planetree skate park, located on Atlantic Avenue on the border of Ozone Park and Woodhaven, after residents complained about the massive influx of children and teens to the park that just opened last month. “I think they were overwhelmed with how many people are coming, so they’re going to be restructuring things,” Giuliani said. One resident noted that the park is drawing “kids from every borough” to the area – something the individual said can be especially problematic because they will spill out from the park onto nearby streets, creating dangerous situations for drivers. 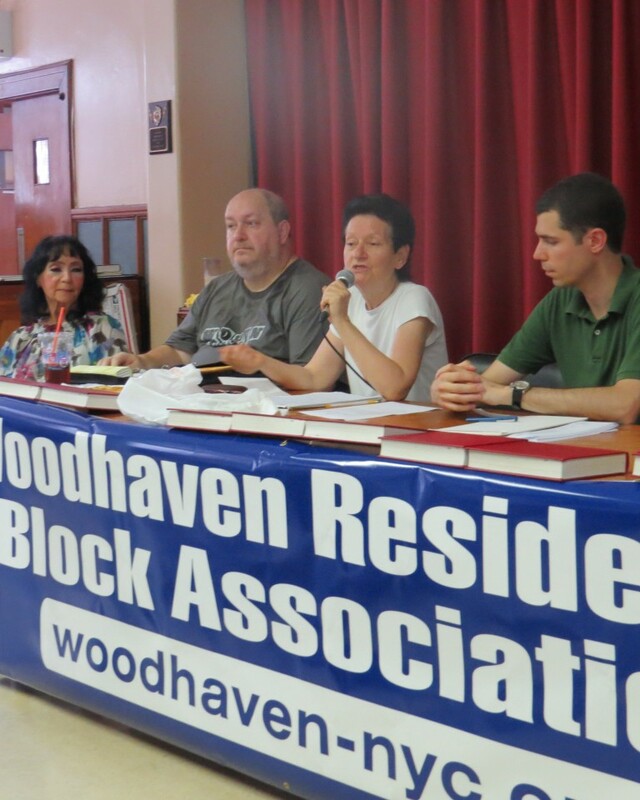 WRBA board members, including Alex Blenkinsopp and Arlene Annunziata, spoke about the WRBA’s upcoming annual fundraiser, which will be held on Friday, Sept. 20 at the Joe Abbracciamento Restaurant on Woodhaven Boulevard in Rego Park. 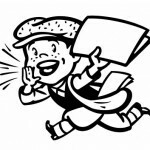 Blenkinsopp, who chaired the meeting in the absence of WRBA President Ed Wendell, announced that, for the first time, the WRBA will hold a press conference Thursday evening to announce the fundraiser’s honorees. Additionally, Annunziata said the WRBA has also launched its “Thank a Vet” program, for which residents can donate to cover the cost of a veteran to attend the fundraiser. Annunziata said a $50 donation will cover the cost of one dinner, and the group is accepting $25 donations as well. The lowest donation the group will accept is $10. Tickets and donations can be made through the WRBA’s website, http://www.woodhaven-nyc.org/. 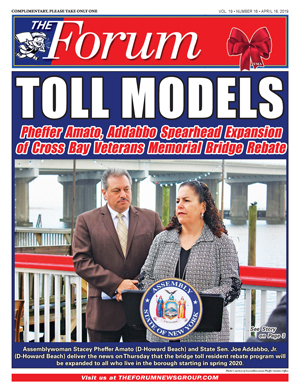 Addabbo landed nods of approval when he told residents he is sponsoring legislation that would allow community groups to access funding from Albany by applying directly to state departments for the money – instead of landing it through legislators. Cuomo has cut off monies that typically go to area organizations, often referred to as “pork,” citing numerous instances of political corruption among state legislators. In 2012, for example, Cuomo made cuts to allocations that would have gone to such groups as the Woodhaven Development Corp., the Forest Hills Volunteer Ambulance Corps, Maspeth Town Hall, Howard Beach’s Columbus Day Foundation, Ozone Park’s South Queens Boys and Girls Club, and the Juniper Park Civic Association, among others. “You have our full support for this bill,” WRBA board member Vance Barbour told Addabbo. Kate Mooney, representing Councilwoman Elizabeth Crowley (D-Middle Village), told the crowd that, after battling with the city, PS 254 on 101 Street at Park Lane South has begun serving free summer meals for all children 18 years old and younger.